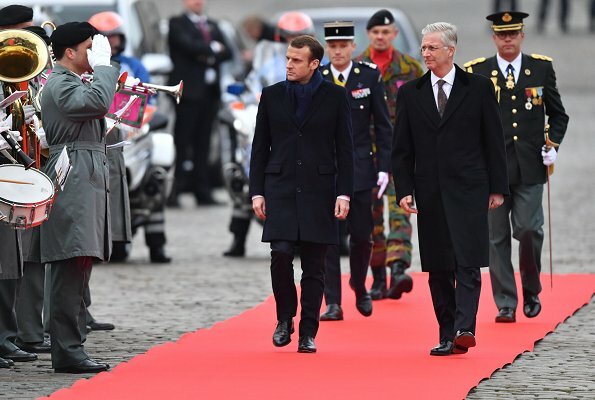 French President Emmanuel Macron and his wife Brigitte Macron are currently making a state visit to Belgium upon the invitation of the King and Queen of Belgium. 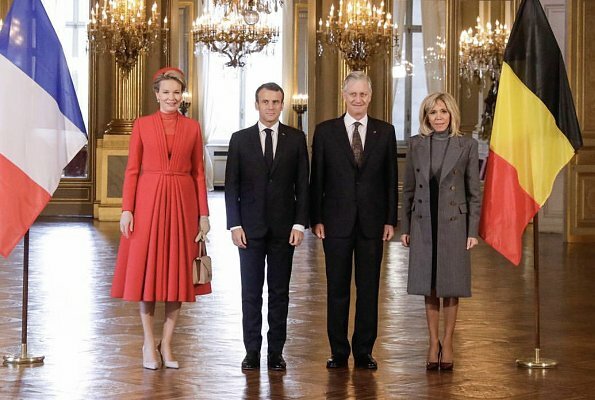 On November 19, 2018, King Philippe and Queen Mathilde of Belgium welcomed French President Emmanuel Macron and his wife Brigitte Macron with a state ceremony held at Brussels Royal Palace. 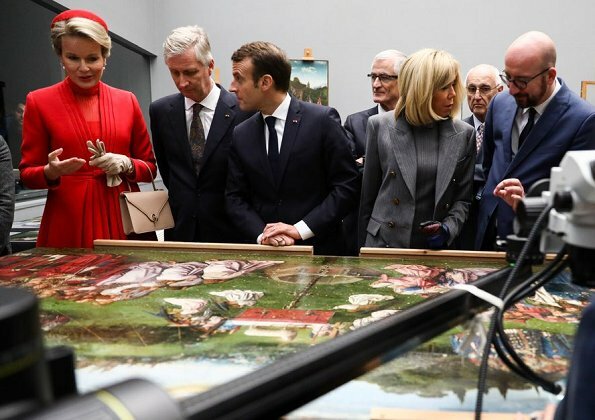 Afterwards, the French President and his wife visited MSK Fine Arts Museum and the City Hall together with the King and Queen. In the evening, a state banquet will be held at the Royal Palace of Laeken. Mathilde looks smashing in red. But Mrs Macron absolutely steals the show in her fabulous ensemble. Very very chic and the below the length looks so much better. For once, Mrs. Macron has it right! To me, she always looks ridiculous in her too short dresses, but today she is chic and doesn't try to look like an 18-year old. I don't care much for Mathilde's outfit, it makes her look fat. The right length in Brigitte´s skirt makes a world of a difference! Indeed gabriella and vanessa. Mrs Macron looks here also much younger than when in mini dresses. Die Kleidungsstücke von Mathilde an sich finde ich schön- aber nicht an ihr. Früher hätte ihr das problemlos gestanden, aber sie bekommt jetzt eine schöne, weiblichere Figur, sodass sie durch dieses Outfit breiter/voluminöser wirkt, als sie tatsächlich ist. Mathilde is pretty in the red and I like her little hat, but a straight dress would have been so much more flattering. This dress has way too much fabric. Brigitte's coat and dress are very classic and chic. This is the length of dresses and coats she should wear, very nice! It took Mme. Macron long enough to figure it out, perhaps she reads critics. It's the first time I like one of her outfits. I think black or dark gray shoes would have looked nicer for fall than tan ones. From my side as well I would say that Mathilde's coat is not fitting her so well. A straight style would be better. La forme et la couleur de cette tenue ne va pas à la reine Mathilde. Lovely as the colour and style is, this outfit makes Mathilde look bigger and broader both on the top and from the waist down than she really is. 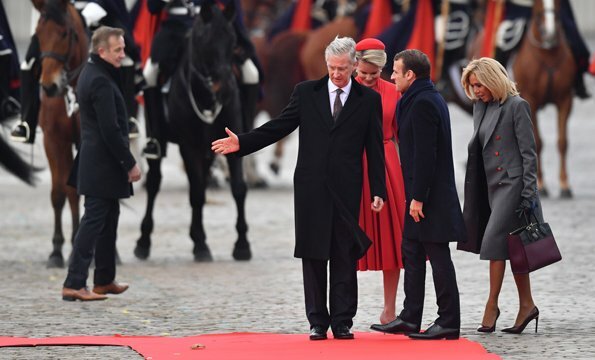 Madame Macron looks very sharp and très chic. Why are her coat buttons changing colours in the photos? 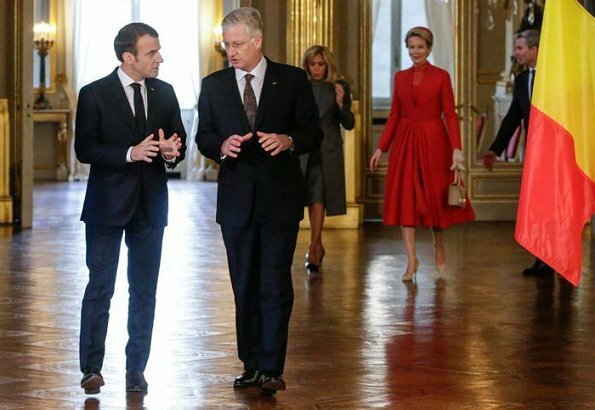 I agree about the ladies' outfits: way too much red fabric and the outfit on Mrs. Macron looks, finally, very smart. The button colors changing - are they perhaps reflecting the ground below them? The buttons have different colors. It is part of the styling. I have seen this before on other clothes. I love the top of Mathilde's dress and the color as well. 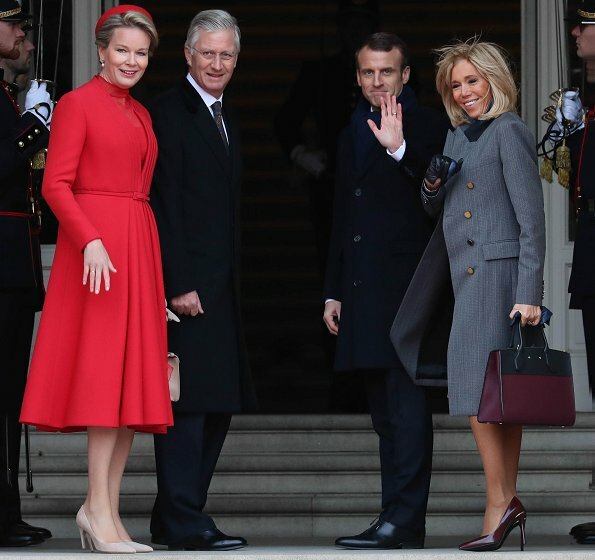 The bag and shoes of Mrs. Macron are beautiful, but they don't fit with the buttons on her coat. Mme Macron:perfecta, Matilde favorecida en el color y coincido recto mejor! 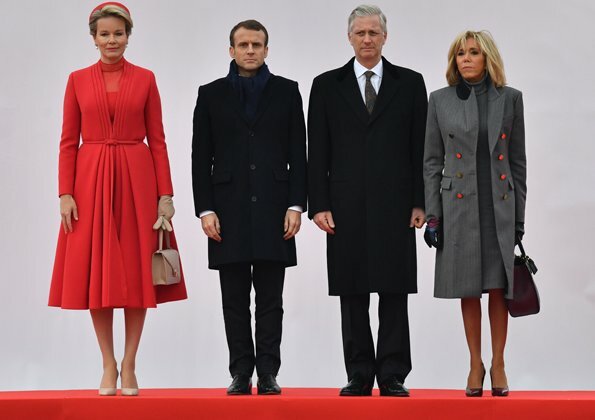 Winter is coming :)) Mme Macron lleva la ropa por debajo de las rodillas... Sus zapatos y bolso son magníficos. Mathilde mal, demasiada tela que la hace parecer enorme. Mathilde parece una mesa camilla con ese vestido, que además es tirando a feo, la verdad. De Madame Macron,¿qué puedo decir? Desde que aparición en escena soy una fan de Brigitte y en esta ocasión me encanta la ropa que lleva y cómo la lleva. 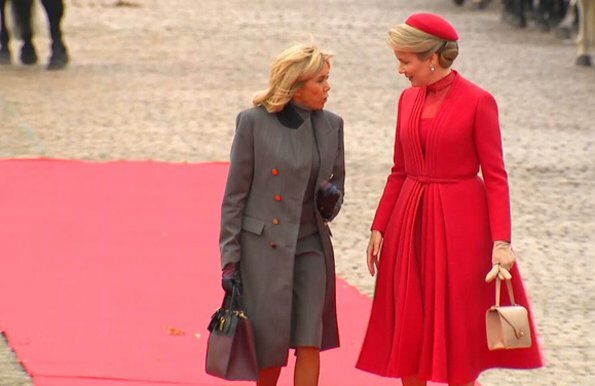 Love the red on Queen Mathilde and her hair and hat but the style is just so wrong - it manages to make a woman with a nice figure look far bigger and wider than she is. Madame Macron looks very elegant with this longer style and smaller shoulders. I am afraid I'll be a bit more critical than you Franny, Mathilde used to have a "nice figure" but recently I think we could notice that she has taken some weight and her style should be adapted. This coat does not fit her at all right now. Ms. Macron looks fabulous, so incredibly chic and age appropriate. The bag and shoes elevate the sober grey, and I want them!! Mathilde's outfit is about the worst I have seen lately, too much fabric, too matronly, and frankly a little too much for a morning event. I agree. Ms Macron looks great, Mathilde less so. Madame Macron looks sooooo goooood!! The coat is so tailored and I love the color with her stiletto heels. She wins the style sweepstakes today!! Wow to both Ladies. Mathilde looks great in red she should wear this color more often. Mme. Macron is wearing Dior I think. Both Ladies are stunning. I believe Mathilde has become a bit bigger, it is not just this outfit. Look at s ome other recent photo's (when not wearing black). 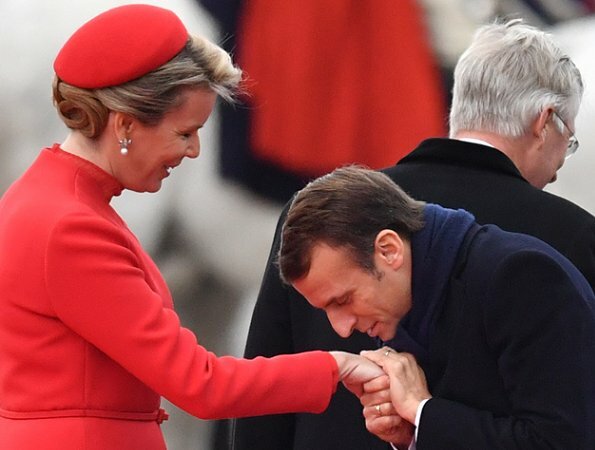 Mme Macron really looks fantastic, Mathilde is also very very nice. Fantastic red ensemble for Queen Mathilde! Do you know who is the designer? She looks so elegant, so impressive and so feminine!